Once again we are launching another issue of our yearly magazine with its record of what we have done, and what we have tried to do. A school magazine is valuable not only because it brings the history of the school up to date, but also because it gives the reader a clear view of the various activities that make a school what it is. It allows him too, to note the traditions of the school and see how they grow. For you must remember that when I refer to tradition, I do not mean a legendary past at which we cast a wistful glance, but a high ideal for which we are always striving. I am pleased that this issue is as good as any in the past, and I congratulate all those who have been responsible for its production. Once again as in 1953, the people have returned the PPP at the head of the polls and many an aspirant for Legislative honor is now in retrospective melancholy, seeking the repose of the political grave. However, as the plaudit and the fanfare die down, we become increasingly aware of the long and difficult road ahead. This Party has been given a second chance to pull British Guiana out of the rut of political and economic stagnation which has been her heritage for so many years. The fulfillment of the hopes and aspirations of a poverty stricken people rests with the present Government and we feel that they are not unmindful of this. While we extend our best wishes as they assume the burdensome mantle of office, it is patently obvious that the future salvation of British Guiana lies not so much with them, but with you – the future generation. Queen’s College has produced many an outstanding leader in the community and indeed at the last general elections all five Party Leaders were ex Q.C. students. But while not casting aspersions on any of these leaders, we say emphatically that British Guiana is in dire need of men of sound judgment, courage, faith, and above all, integrity. It now remains for Queen’s College and its kindred institutions to mould such men. We must produce men capable of guiding the destiny of Guiana. But the destiny of mankind is not governed wholly by its “stars”. It is unlikely that many of us will be famous or even remembered in the annals of Guiana, but not less important than the brilliant few who lead a nation on to achievement after achievement, are the unknown many who guard and maintain accepted values and conventions and whose inconspicuous triumph it is to pass them on unimpaired to their sons. In the words of our Principal, Mr. Sanger-Davies, "Our aim is to provide a background of school life in which our boys will grow up to value these qualities in one another and to strive to acquire them ourselves. When this is achieved we shall not have worked in vain". Sitting (L TO r): E.P. Clayton, S.E. Wilson, S.R.R. Allsopp, N.E. Cameron, H.A.M. Beckles (ag. Principal) E.O. Pilgrim, D. Hetram, L. deW. Dolphin, E.W. London. Standing (L to R): M. Lowe, L.W. Keates, E.A. Wason, C.P. Yhap, M. Grassie, R. Moore, H.R. Persaud, R.M. Jonas, H.A. Whittaker, Mr. Potter, P. Dyal, C.E. Barker, Mr. Hinds, I. Chung, V.R. Humphrey, C.J. Barker, J.J. Niles, R.D. Rock. Front Row (L to R): W.M. Sue-Ho, J.S.L. Browman, A.R.A. Lee, A.R. Smith, E.A. Sue-A-Quan, H.A.M. Beckles (ag. Principal), R.B. Fields, N.A. Rodway, G.H. Mitchell, R.L. Haynes, O. Austin. Standing (L to R) B.R.G. Persaud, M.A.A. McDoom, W.A. Lee, K.O.E. Barrow, R.W. Layne, T. Wiltshire, M. Fung, M.A. Kendall, A.M. Reid, R.W. France, G.E. Woo-Ming, D. N. Sharma. Front Row: D.A. McWatt, R.M.S. Khan. Back Row: J.A. 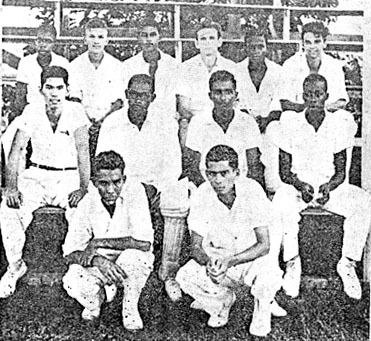 Nicholson, R. Roberts, F. Rampersaud, B.I. Smith, F.A. Lawerence, P.M. Stuart.